Following is an Objection I put into Wollongong City Council over a rather outlandish proposal by a developer. Who certainly has got away with it! Passed and ignored, the Council seems to sell off public assets!! As a resident of 26 years in Longview Cres, Stanwell Tops, I have considered the information available. 1. Council must not be misdirected away from the fact that this DA-2016/389 came about because the applicant and owner of 8 Longview Crescent built a “granny flat”/secondary dwelling at the rear of their property without the legal access that the Secondary Dwelling Act calls for. The reason for this lack of secondary dwelling access is that it appears an illegal colourbond fence subdivides the property which Council was unaware of till contacted by concerned residents. The residents were also concerned for an excavation on the Council access land to Henry Halloran Park. Secondary dwellings must access from the front of the property with parking either on the front property or street parking. At the rear of the property there is a concrete crossover actually on Council Community Land (Henry Halloran Park). Both structures, fence and crossover are not shown on plans of the Access Way of the applicants adjacent block apparently submitted to Council even after they were built. 2. The Longview Crescent North Access way to Historic Henry Halloran Park is a Community Council Asset. I have submitted a Heritage Nomination on Henry Halloran Park which Council now have. The Stanwell Tops ratepayers would consider that there is a Duty Of Care for Council to protect Henry Halloran Park for public use. 3. It now seems that a previous Council, under then Mayor David Campbell and then General Manager….., Rod Oxley, granted a ''Right of Carriageway'' lease to a (long-departed) resident in 1998, for $5,000. This may have been because previously this access way lead to the historic Stanwell Tops Bush Fire Brigade, formed in 1954, and the then owner was able to access the rear of his property as shown on the 1977 Council aerial image below. Subject area outlined in red. With the removal of the Bush Fire Brigade, it would be logical and easy to understand that eventually the owner of 8 Longview would seek assurances of continued use by seeking a “Right of Carriageway” from Council. The lease has no stated period of time for use on it which would appear not to conform with current rules. A council may only sell, exchange or otherwise dispose of community land if the relevant provisions of the Act have been complied with. A council may grant a lease or licence of community land, but only in accordance with s.46 and (if relevant) s.47 Local Government Act 1993. Note A council may not grant a lease or licence of community land for a term greater than 30 years. Where any lease or licence granted over community land for a period (inclusive of any option) exceeding 21 years the consent of the Minister for Local Government is required (Sec.47(5))." 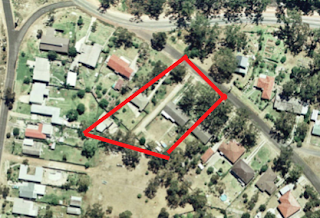 In any case, it would be logical to reason that the appropriate current Minister for Local Government should be alerted by Council to this DA as to whether the Minister still agrees to this “Right of Carriageway” lease since the applicant wants a permanent structure of a concrete driveway that would obviously outlast the remaining 12 years of the lease. Certainly it is an overall term exceeding 21 years to involve the Minister as shown in the Act. 3. About two years ago, WCC undertook a controversial (and costly of at least $40,000) modification to Henry Halloran Park of a “swale”. By creating a ''swale'' for stormwater diversion purposes which unfortunately after heavy rain now leaves a section of ground muddy and unusable. Council also notified residents who back onto the Park that they can no longer use the Park to have vehicle access to the rear of their properties. Now however it appears Council has completely forgotten that notification by allowing this DA for private access. 4. Any granting of private constructions on the public accesses to the Park would obviously create a dangerous precedent by allowing similar claims on Council Community Land in the Wollongong LGA that would no doubt refer to this issue in demanding equal rights. That would place WCC in a position in the future, with possible Appeals to the Land and Environmental Court, with costs being paid for by ratepayers. It could also lead to accident claims on Council as this driveway, if allowed, will be a mecca for children on skateboards etc, with not only the dangerous power pole at road entry as shown, but also if children ride out to the road with the possibility of being hit by unsuspecting road traffic. 5. 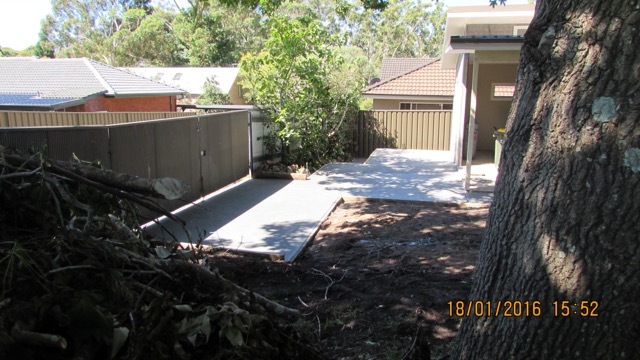 In the applicants unprofessional Statement of Environmental Effects their purpose is also misleading in stating they want to get to the garage at the back(shown on plan), but the concreting actually already done on the property itself does not allow that as it ends just inside the gate. Very strange indeed. If indeed there was suppose to be a driveway, why was it not constructed at the same time? See image. Image above showing the concrete ends just inside of side entry gates. 6. 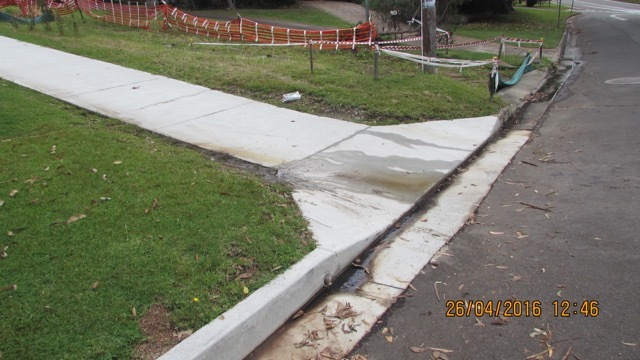 The proposal raises the chances of new erosion channels at the concrete/grass interface giving rise to ongoing Council maintenance on the steep sloping Park access laneway. This erosion/runoff already occurs on the applicants new driveway on the front of their property as shown in the photo below. It also happens to other drives on this south side of Longview Crescent because of not only rain but on going ground water seepage from the Park, being a higher point. Photo above shows ongoing water runoff and adjacent erosion of unstable soil. Image showing native banksia having been cut back. 7. 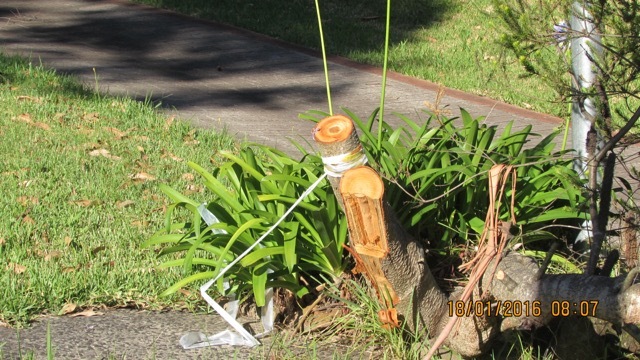 They also state that "no trees will be impacted" but they have already cut down a native banksia tree within the access way to which I have an image (see above). 8. The mention by the applicant of the public using the applicant's access driveway to reach the park when it rains is ridiculous. Why go there is it rains? 9. Regardless of the “Right of Carriageway” lease and granting of the right of way, there is no mention that they are actually allowed to build anything on it. Which would indicate that only the ground was leased without development rights which would logically have been attached. a. It is extremely disappointing that Wollongong City Council have admitted that they have not notified every ratepayer in Stanwell Tops of this DA on Community Council land. That, in it self, is a failure of “Duty of Care." b. If it wasn’t for diligent residents alerting Council, this DA would not have happened, unless it was submitted to Council for a retrospective approval as the work without legal authorisation, would have happened within a day or two of discovery. And apparently Council knew nothing about the concrete driveway access. c. Residents knew nothing about a previous DC-2016/678 for the crossover in the road reserve which for some reason can’t be currently found on the Wollongong City Council website. Advocating innovative research and practice to improve urban planning The University of Sydney, through the generous gift of Warren Halloran, has established a Trust in honour of Henry Halloran who was an active advocate for town planning in the first half of the twentieth century. The goal of this trust is to promote scholarship, innovation and research in town planning, urban development and land management. This will be achieved through collaborative cross-disciplinary and industry research that will generate innovative approaches to urban and regional policy, planning and development issues. "Will Council allow a concrete driveway on the only Park named after Henry Halloran in New South Wales? So, therefore for all the points above, I strongly object to this DA and Council should too, to protect a Council Community Asset. Council must uphold the historic significance acknowledged regarding Henry Halloran. Council can resolve this matter easily by way of rejection, including termination of the lease and restoration of the damage, for the benefit of the general public. NOTE: All images, etc, used are dealt with under the “Fair Trading” Section of the Copyright Act 1968.